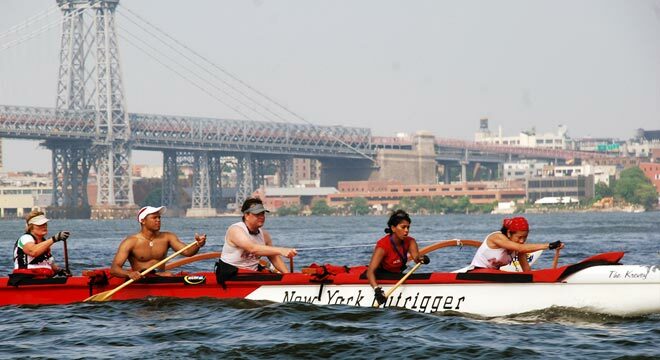 New York Outrigger is a 501(C)(3) nonprofit organization dedicated to perpetuating the sport of outrigger canoe paddling. Established in 1996, NYO has afforded thousands of New Yorkers the unique opportunity to experience their city from its waterways. Our all-volunteer organization is comprise of a diverse group of paddlers committed to helping New Yorkers develop the skills required to be safe and responsible members of New York City’s waterfront community. Located in Hudson River Park in Manhattan’s Chelsea neighborhood, NYO provides outreach programs and competitive team training for various skill levels. Through our Novice sessions, Nonprofit Partnerships and Special Events, NYO members have the opportunity to interact with a diverse cross-section of the city. Additionally, our training programs for members cover the spectrum from recreational paddlers to elite racing crews. For more information on New York Outrigger and the various programs they offer, please visit their website: www.newyorkoutrigger.org.